Free Shipping Included! 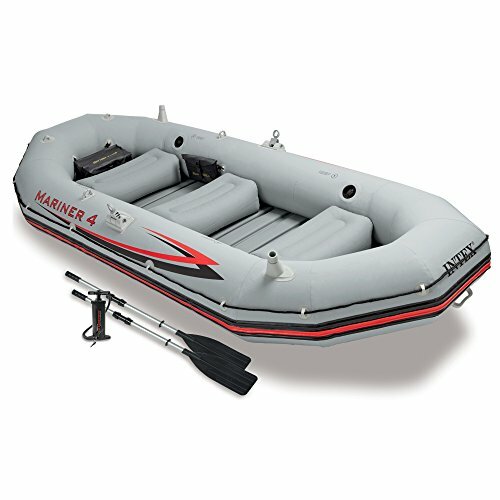 Intex Mariner 4, 4-Person Inflatable Boat Set with Aluminum Oars and High Output Air Pump (Latest Model) by Intex at Breezin Thru Charters. MPN: 68376. Hurry! Limited time offer. Offer valid only while supplies last. The strong molecular structure of this plastic makes it highly resistant to damage from abrasion, impact and sunlight. Four Boston valves on main hull chamber for quick-fills and fast-deflations. The keel is inflatable; this results in improved control and handling. A durable rock guard lines the circumference of the hull above which an all-around nylon grab line circles the upper hull. Weight Capacity: 880 Lbs. (400 kg) - Inflated Dimensions: 129" x 57" x 19" (328 x 145 x 48cm).